Windermere is a scenic small town situated about 1 mile east of Lake Windermere. The towns name was changed from Birthwaite to Windermere after the railway reached the town in 1847. Windermere expanded southwest until joining the town of Bowness-on-Windermere. The two towns are now basically one large town, with two centre's. Regular buses run between the town centre's. 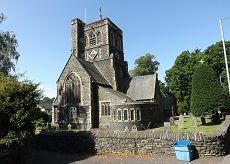 Bowness-on-Windermere is right next to Lake Windermere, with boat trip piers. Windermere Town has a good verity of restaurants, bar/diners, cafe's, hotels, B&Bs and self catering properties. The town is a good base to explore the Lake District, and often not as busy as some of the towns right next to the lakes. The large Windermere Hotel, originally named The Riggs Windermere, is situated on the north side of the town by Windermere Railway Station. The hotel opened around the time the railway between Kendal and Windermere was completed.